Like his father Robert, a plumbing contractor, Bill Butler went into business for himself when he was 22. That was 50 years ago, and the now 72-year-old Butler is in the process of exiting from the real estate development business that has made him one of the most prominent and influential businessmen in the region and the state and, perhaps, one of the wealthiest. As he marked his 50th year in business on March 15 Butler has developed a detailed strategy for what he calls his T-R-E – short for The Reconstituted Enterprise – a self-imposed plan that calls for him to play less of a role in his Corporex Cos., whose roots go back to 1965. And although nothing is certain at this point, Butler said the company may spin off some of its components as it undergoes a transformation. He said one of the reasons for his decision to get out of the development business is simple. “Because I don’t want to go to my grave with a briefcase,” Butler said one cold Saturday morning last month, when he was comfortably ensconced in what he calls his Saturday office – the rear corner booth at FirstWatch, a restaurant that was bustling at mid-morning. Securing that table was not difficult. Butler’s Corporex built and still owns the RiverCenter building where FirstWatch is located. He talked about setting up a non-profit that might, for example, build infill housing in Covington and – perhaps — a “model neighborhood” project near Jackson and Orchard streets in the city’s Westside neighborhood. Northern Kentucky’s Catalytic Fund intends to provide resources to create a development plan for the area, but has made no further commitments, said Jeanne Schroer, executive director of the fund and a former executive with Corporex, which has pledged $1 million to the organization. But one of the biggest projects ever proposed for Northern Kentucky – Ovation in Newport – won’t be tackled by Corporex, which acquired the 14-acre site at the confluence of the Ohio and Licking Rivers in 2006 for $13.5 million. When it purchased the property from the City of Newport, Corporex said that as much as $1 billion would be invested on a project that would include a hotel, condos, townhouses, retailing, parking and what was described as a “Las Vegas-type showroom” that could seat as many as 3,000 people. On a much smaller scale, Butler said he has tentative plans to launch a community improvement project on the parking lot property near Third and Greenup streets at the south end of the Roebling Suspension Bridge in Covington. He recently acquired the property in a swap with the City of Covington, which received the parking lot at Pike and Washington in the trade. The site may become a public plaza with one level of underground parking, Butler said. Butler declined to offer any specific timetable for his decision to play a less active role with Corporex and resisted characterizing the move as “stepping back, stepping aside or stepping out” of the leadership role. “I’m trying to reposition, transition or re-align, re-balance, but stepping out — I mean I’m not stepping back in terms of my activity. I’m changing from what we’ve done for many years to…trying to finish the job, kind of, finish the dream or… advance the dream in Northern Kentucky,” Butler said recently. “I see us turning into a financial investment company and I see us maybe spinning off a few entities, but as to your question about development, will it be what it has been, I think the answer is, ‘No, it won’t be.’ It will turn into a financial investment entity that could invest with other people in real estate,” Butler said in the February interview. “I do have a plan…to develop a not-for-profit development company here in Northern Kentucky that would take on the projects that others would not because they’re not-for-profit, more for the community than they are for profit. “So we’d be building that company… doing some neat infill housing and some things that would change the nature of Covington…I want to do a lot of things. I simply need time. I’m still dealing with a big enterprise (Corporex). Until I get us…transformed to where we’re basically just a money machine – an investment vehicle — I won’t have the time,” said Butler, adding that he has in the past – and continues today – to devote a substantial amount of time to community projects where he doesn’t make a dime. Beneath the Corporex Companies umbrella are Five Seasons sports and fitness clubs; Commonwealth Hotels, which manages hotels, and Corporex divisions that build, own and lease residential, commercial and industrial buildings, especially hotels. Butler declined to provide any details about what entities might be spun off and which of his executives might wind up running them. “Anything I say is uncertain and it wouldn’t be appropriate,” Butler said. Butler said Corporex will evolve into an investment firm by selling its “hard assets” – its real estate – to accumulate cash. He declined to offer an estimate about how much that real estate might be worth for a variety of reasons, including the fact that much of the property is mortgaged and that he didn’t want to provide precise details on what the properties might be worth versus mortgage debt. The Corporex website says the company has real estate assets of $1 billion. 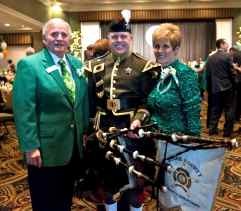 Bill and Sue Butler have been actively engaged in the NKy community and have received numerous recognitions for their service and generosity. It is, however, all but impossible to gather financial data from independent sources because Corporex is privately held. Butler sold the publicly traded Eagle Hospitality Properties Trust, which was listed on the New York Stock Exchange, in August of 2007. As a public company, Eagle was required to make regular financial disclosures and hold an annual meeting of shareholders. Over the last 50 years, Butler said his fortunes and those of his company have mirrored what was happening with the national economy. “In 1975 I lost just about everything I had built up for 10 years in one year. I went from 155 people to two field people. I went from 38 salaried and clerical people to 11,” Butler said. “I went through that period for two or three years without taking a salary…and then we had to rebuild it from there and we’ve done that two or three times,” Butler said. 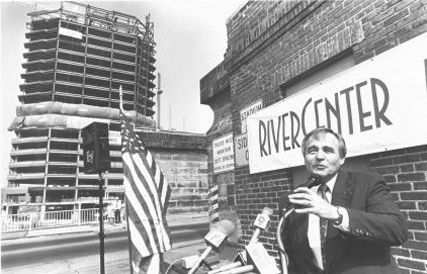 The company went through another rough period in 1981 and 1982 and then again around 1990, just two years after Butler broke ground for RiverCenter I along the Covington riverfront. “It was a severe recession — worse than the one we just went through,” Butler recalled. After opening RiverCenter in June of 1990, he said it took 3½ years to break even on the building as the commercial real estate industry went through a dramatic downturn. “I went 4½ years without being able to borrow a dime,” said Butler, recalling how Corporex went into survival mode for about five years. As the U.S. economy slowly recovers from the most recent recession, Butler sounded confident that he could expand the company if he wanted to. Doubling the size of Corporex simply isn’t part of the T-R-E plan, Butler said. Butler acknowledged that he has a “huge” vacancy rate at what has become his signature project in Northern Kentucky – the RiverCenter I and II office towers that created a highrise skyline for Covington. 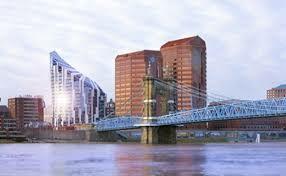 “Greater Cincinnati has not recovered from the recession,” Butler said. “There is a 22 percent vacancy rate in downtown (Cincinnati) office space…(Ohio) Governor (John) Kasich spent 38 million bucks to take our two major tenants out — across the river, and they’ve still got a 22 percent vacancy,” said Butler, referring to the recent loss of two of his biggest tenants, A.C. Nielsen and Omnicare, which were lured to downtown Cincinnati with incentives that were underwritten by the state of Ohio. Does the vacancy rate pose a substantial threat to Corporex? Butler also pointed out that he and Corporex are deeply immersed in a court battle with Bank of America over financing for Madison Place, the highrise office-hotel-condo building that is immediately west of the RiverCenter towers. The developments he referred to aren’t in this region. Corporex Colorado and a development partner are building the $50 million Museum Center and The Art, a 165-room boutique hotel on the upper floors of the center. The company also is building an $80 million hotel and office complex near the Anschutz Medical Campus in Aurora, a huge (population more than 300,000) suburb of Denver. Closer to home, Corporex and a group of investors are building five hotels in northeast Ohio that are linked to business growth related to oil production through the controversial process known as fracking. Butler said there hasn’t been any investment in hotels in that corner of Ohio for 25 years because of the decline of the steel industry. “We saw it as an opportunity and we put a partnership together and we’re going to try to sell them in two years, so we had to keep some things going to keep the machine fueled,” Butler said. “But they’re the last big projects under the plan,” Butler said in a reference to the Colorado and northeast Ohio projects.